Be the first to share your favorite memory, photo or story of Burniss. This memorial page is dedicated for family, friends and future generations to celebrate the life of their loved one. Swell is a man who knows naught but love; he who lives with knowledge of the world and its evils and strides forward against all odds with working hands and a soul that cannot be tainted. A husband, father, grandfather, fisherman, and master mechanic, Burniss Lee Tiller was a great deal more than all of these things combined. Whether there was an engine that needed fixing or a cabinet that needed building, no task, job, or project was too daunting. He was a brave man and a man of few words, but all his words are worth their weight in gold. If anything is certain it is that he lived every moment of his life for his family and his neighbors. The legacy he has left behind is one of kindness, compassion, and trust, and those who have known him will forever know unconditional love. 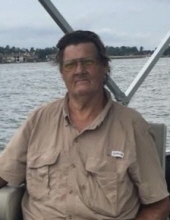 Burniss Lee Tiller of Houston, 70, passed away Thursday, January 10, 2019 at Houston Northwest Medical Center following a heart attack he suffered while working on a vehicle. He leaves his wife of 50 years, Rebecca “Boss” Tiller; his daughter, Elizabeth Tiller Stevens and her husband, Ronald Stevens; his brothers, Guarry Tiller, David Tiller, and Joe Tiller; his sister, Delma Ruth Palumbo; his four grandchildren, Hunter Logan Strevens, Brennan Lee Stevens, Richard George Gee, and Christopher Lee Tiller; his two great-grandchildren, Nataliya Elizabeth Gee and D’Nikko Izreal Rubianes, and many other family members and friends. Born in Mountain Home, Arkansas and raised in Santa Fe, Texas, the son of Joseph and Wilma Tiller, he was a lifelong resident of Houston. In his early years, he helped around a local dairy farm milking cows. After graduating from Santa Fe High School in 1967, he was drafted into the Army as a mortarman, serving in Fort Bliss, Fort Ord, and Germany. After serving in the Army, he moved back home and began working at a Shell station. He later started his own business, Lee Tiller Automotive. Over the years, his mechanical expertise and professional reputation led him to being one of the most popular auto mechanics in his part of Houston. He lived the remainder of his years out continuing his passion of working on vehicles and finding odds and ends to do around the house. The family would like to thank the doctors, nurses, and staff of the VA Hospital and Houston Northwest for the exceptional care they have provided him during this challenging time in our lives. To send flowers or a remembrance gift to the family of Burniss Lee Tiller, please visit our Tribute Store. "Email Address" would like to share the life celebration of Burniss Lee Tiller. Click on the "link" to go to share a favorite memory or leave a condolence message for the family.